Today there is quite a bit of excitement about human gene discoveries and the Human Genome Project (HGP). 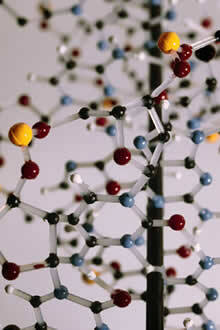 In April 2003 the human genome sequence was completed and published. Nature's complete genetic blueprint for a human being is now known. April 2003 also marked the 50 th anniversary of another great achievement in biology - the description of the DNA double helix by James Watson and Francis Crick. The HGP has revealed that there are probably somewhere between 20,000 and 25,000 human genes. The completed human sequence can now identify their locations. Already, more than 12,000 of these genes have been discovered in relation to many diseases and more than 800 genetic tests are available. The public health impact of the human genome revolution is staggering. Nine of the top ten causes of death, most notably chronic diseases such as cancer and heart disease, have genetic components resulting from the interaction of genetic variation with modifiable risk factors. A large fraction of children's hospitalizations are due to diseases with strong genetic components. The good news is there are interventions that can save lives and prevent disease. Genetics is the scientific study of heredity, which is how particular traits are passed from parents to children. Chromosomal abnormalities inherited from the mother and/or father may result in a genetic disorder. Genetic conditions affect all age, economic, social and religious groups. Rapid advances are now occurring in genetic screening/diagnosis, including the ability to link particular genes with specific conditions (cancer, hardening of the arteries, etc.) The Missouri Genetic Disease Program was established for the purpose of increasing general knowledge of genetic conditions, informing residents about the availability of genetic services, and expanding genetic services to outlying areas of the state. The Department of Health and Senior Services contracts with four genetic tertiary referral centers located in Missouri's four university-affiliated medical schools. The staff of the four centers provide genetic diagnostic evaluations and counseling, genetic screening and genetic education. A network of outreach clinics have been established to make medical genetic services available to geographically and/or culturally remote areas of the state. This involves sending a genetic team from one of the genetic centers to an identified area for at least one day every three months. Newborn blood spot screening refers to tests performed on newborns shortly after birth to protect them from the dangerous effects of disorders that otherwise may not be detected for several days, months or even years. For over 50 years Missouri law has required all babies born in the state to be screened for certain metabolic, genetic, and endocrine disorders. Whether the baby is born in the hospital or at home, the newborn blood spot screening should be done between 24 and 48 hours of age. Babies who appear healthy and come from healthy families can still have serious medical conditions. Newborn screening helps health professionals identify and treat conditions before they can cause serious health problems, disability or even death. Most babies identified through newborn screening are treated early and grow up healthy. Effective January 1, 2002, state law mandates screening the hearing of all infants born in Missouri. The purpose of the NBHP is to identify infants with hearing loss and ensure their linkage with services. Early identification and treatment of hearing loss are essential so that speech, language, and learning can develop as normally as possible. Effective January 1, 2014, state law mandates screening all infants born in Missouri for critical congenital heart disease (CCHD) through pulse oximetry screening. CCHD is the name given to specific congenital heart defects. These defects in the heart occur before birth, cause blood to flow in an abnormal pattern, and may lead to blockage of blood flow throughout the body. If left untreated, these defects can lead to death or can cause serious developmental delay. Pulse oximetry screening is most likely to detect seven specific CCHDs. These include: hypoplastic left heart syndrome, pulmonary atresia, tetralogy of fallot, total anomalous pulmonary venous return, transposition of the great arteries, tricuspid atresia, and truncus arterious. The Sickle Cell Anemia Program provides information to the public and health professionals about sickle cell anemia and sickle cell trait, and promotes and provides screening, referral, counseling and follow-up services for Missouri citizens at risk for sickle cell disease. These treatment programs provide assistance to individuals 21 years of age and over who meet the medical and criteria. These programs provide financial assistance for outpatient and inpatient services, prescription medications, home medical equipment, blood factor products, emergency care and service coordination. The Metabolic Formula Distribution Program assists with the purchase of prescribed dietary formula and provides an annual examination to children and adults diagnosed with medically eligible metabolic disorders such as PKU or Maple Syrup Urine Disease (MSUD). This Registry is a passive system that identifies infants with birth defects by monitoring information submitted on the birth certificates, hospital patient abstracts, death certificates, and special health care needs information systems. The Missouri Genetic Advisory Committee is a governor appointed advisory board, which advises the Department on the provision of genetic services. To address specific issues, the Committee has four Standing Committees: Newborn Screening, Cystic Fibrosis, Hemophilia and Sickle Cell. The Genetic Advisory Committee and Standing Committees meet at least annually to monitor, review and analyze programmatic activities.